Tiertime has finally released a new piece of 3D software to replace the current Up! 3D slicer and editor. UP STUDIO, currently in beta, boasts a truckload of amazing new features, including wi-fi connectivity, mobile device compatibility, in-built help and support videos and custom material profiles, just to name a few. UP STUDIO is currently in Beta testing versions, so we can expect to see a few bugs, but overall, some amazing new features. Here are a few of the best that stood out for us. Tiertime’s new UP MINI 2 features wi-fi connectivity, allowing for you to transfer jobs and maintain your printer wirelessly. Users can switch between any printer connected to their network and quickly view unique information such as serial numbers. 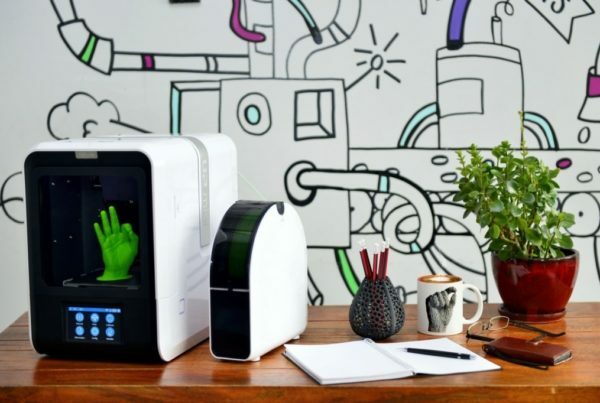 The UP 3D printers are now truly portable with the UP STUDIO app available on the Apple App Store, allowing users to harness the wireless capabilities of their printers, on-the-go. The UP STUDIO mobile app is almost the exact same as the desktop app – you can change over filaments, monitor your print job and even scale, rotate and move your models before printing. You got a problem? No problems. UP STUDIO comes with a growing library of in-build support videos to help you when you get stuck. At the moment, there are only a few videos on basic topics but that’s set to grow over time. UP users have been waiting for this features for years, but now it’s finally arrived. The newest version of UP STUDIO allows you to create custom material profiles. Within these, you can change the nozzle temperature and heated bed temperature. As a result of this, you now have the opportunity to print with a wider range of materials than those offered by the UP range. Users are required to be logged into their UP 3D accounts to access custom material profiles. This is so they can access your materials across all your devices. Scaling, rotating and moving your objects just got a lot easier. Gone are the days of typing a value into a box and hitting enter to transform your object. Now you just select which axes you want to affect and drag the 3D handles. Users also have the option of selecting preset values for your rotation, scale and movement. Upload your photos or graphics, play with a few settings and watch your images print out in 3D! UP STUDIO now has the option to import images as well as 3D objects, and converts them into a printable object. This feature is currently in its early stages, so you can’t expect high-quality results just yet. To download UP STUDIO, head over to our support center and download either the x64 or x86 version for your machine. The Mac app and iOS app are available for download on the relative app stores.